On this last weekend of summer vacation, before the start of another busy school year, we have been soaking up the sun. 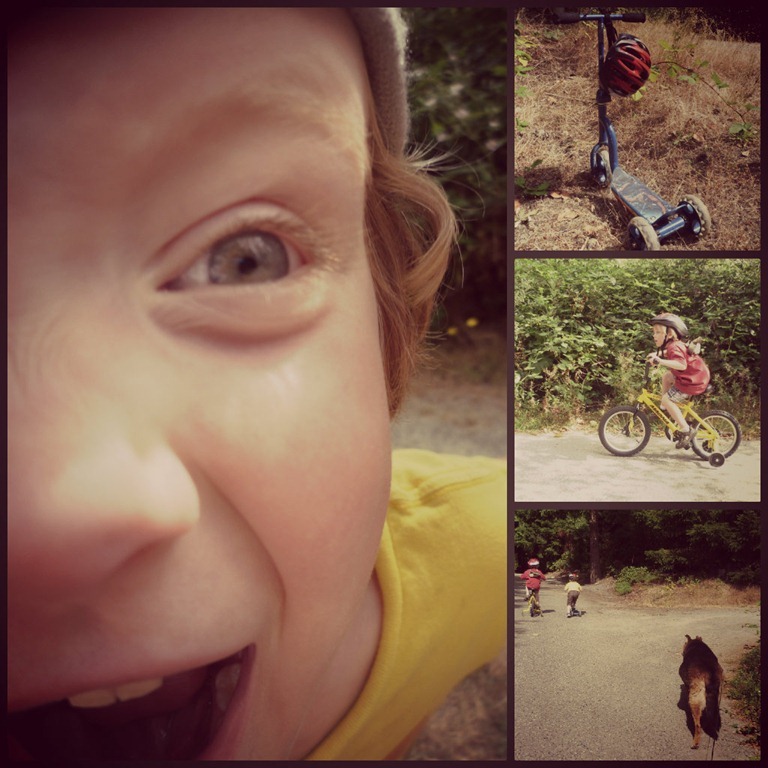 There have been long bike rides, walks to the blackberry patch, water play in the yard, and hanging out with friends. A good friend from out of town is visiting for a short while and we are so excited to spend time with her. We have one day planned of lounging around and showing her our little town and one day planned that includes a mini road trip. This entry was posted in Random Thoughts and tagged bike riding, Family, Friends, Life, Photography, Road Trip, Summer vacation, Sunshine, The moments of life. Bookmark the permalink. Capture away – they are fleeting…………. That they are. We had a wonderful weekend of sun, friends, and adventures. Cody started 1st grade today and we are trying to wrap our brains around this new routine. Carter does not start school for two more weeks so I feel like we are in a crazy, unadjusted time period. I cannot begin to tell you how jealous I am of you because you live in close proximity to fresh blackberries. Carter requested that we walk (and he ride his big boy bike) down to the blackberry patch to pick berries today. We picked a little over 4 cups and I ended up making a wonderful blackberry crumble for dessert tonight – yummy! Wish I could share with you. Carter does not do anything small or half assed. He is full of drama, joy, excitement and when he throws a temper tantrum the whole neighborhood knows. 🙂 I love that kid! Cool. Enjoy the last moments of freedom. We did. I love summer but am also looking forward to the pumpkin muffins and apple cider of fall. I like th weather, leaves & football. He is such a great spirit and when he is happy you can not help but be happy right along with him. Sounds like it is just what you need. Enjoy. Nothing like hanging with family and friends on the last lingering days of summer. It did seem like a faster summer than years gone by. Cody had his first day of first grade today and Carter starts his last year of preschool in two weeks. It feels like summer just got started and now it is back to school time already. Thank you, I hope yours goes well too. I love Summer. I am going to miss Summer. Nice quiet time with no kids is to be cherished! I too, am looking forward to having the wood pellet stove burning. Oh what perfect pictures to add color and sentiment to your blog post. 🙂 Looks like you had some wonderful final days of summer! My son just started kindergarten, and I hear you on the adjustment part. Whoa. Craziness. We are all up SO early to get him out the door, and his little sister too, who comes with us for the walk to school. Five days a week is such a change from the happy little world of preschool. Fortunately our town still offers half-day kindergarten, so he’s home every day before lunch. But we are all kind of, reeling, for lack of a better word. It’s a big transition, as you mentioned, going from summer back to a new grade in school. I hope your little guy is doing well in 1st grade! We lucked out with a wonderful teacher, so that’s helping a lot as we get used to this new routine. Okay, I’m rambling. Just wanted to wish you all a happy start to the new school year, and commend you on your blackberry picking! Isn’t that so fun? This summer we picked strawberries and blueberries and the kids loved it. I’m trying to grow my own, but we are surrounded by bunnies who eat them all at the PERFECT ripeness. How they know, I have no idea. But then I always come ’round to: how can I be mad at bunnies? Thank you for your rambling comment! 🙂 As far as I can tell Cody is enjoying first grade. His teacher does not want parents popping in for the first couple of weeks until they have their routine in place. I am finding it rather hard to stay away but so far I have been good. He has homework every night (20 minutes of reading together, which we would do anyway) so we have set up a time after snack to dedicate to homework. He takes it very seriously, it is pretty funny. That is so great you had half day kinder – our school is full time but only M-Th. I am really missing having Cody around on Fridays. Between the birds and the boys I have only gotten to eat maybe three blueberries from the three bushes we planted earlier this sumer. We don’t have to contend with bunnies (and really, you are right that you can’t be mad at them) because I think just us having a dog keeps them away.